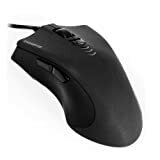 The mouse is a basic input device used in many applications, but its widespread use in gaming has evolved in the recent years, which has led to the development of the gaming mouse specifically. The gaming mouse is designed in such a way that it assists high-tech gamers, providing them an enjoyable and comfortable gaming experience. The Force M7 is made to be a cheap wired mouse and is on the lower end of the spectrum, however it performs exceptionally well for the price, and is comparable to the DS200. The GM-Force M7 has an attractive hourglass shape, giving it a shielding look. The black color of the mouse is the key design element, following the norm when it comes to gaming mice. The symmetrical design of the mouse makes it ideal for claw grip users rather than palm grip users as it is designed this way. The left side of the mouse, just above the grip, contains side buttons as well as a little curve near the bottom for grasping the user’s thumb and pinky. The mouse also includes a non-slick rubber coating over its entire surface, which is sweat resistant. It allows exceptional grip, providing a comfortable experience for long hours of play. Also, the coating makes it easier to clean the mouse. The middle of the mouse contains three downward pointing arrows with LEDs behind them. These blue LEDs indicate the current sensitivity level. Two extra buttons are found on the left side of the mouse that can be used as extra buttons in games or as a navigational tool in a web browser to navigate through different web pages. The GM-Force M7 is capable of using a software application to customize five button settings and sensitivities. Plus, the M7 is powered by 3200 DPI blue gaming sensor that provides optimum tracking resolution for precise control and movement. The 3-stage LED indicators show the current sensitivity of the mouse, and the 3-stage DPI adjustable switch is used to select a sensitivity from one of the three options: 800 DPI, 1600 DPI, and 3200 DPI. The switch is designed in such a way that it enables the gamer’s quick adjustment during the gameplay. Moreover, the mouse comes with a long reinforced USB cable that provides maximum durability. The end of the cable contains a gold-plated USB connector that enables optimum signal transfer. Also, the mouse is fitted with gaming grade feet pads, which provide maximum smooth glide, allowing the users to glide their M7 as fast as they want. The GM-Force M7 is built with high-quality materials to provide strength and durability to the mouse. Although it is large as compared to other mice, is light in weight and has a perfect claw fit. As compared to the price, the GM-Force M7 provides all the features required for a basic gaming mouse. Its frame rate of 3600 frames/second and maximum tracking speed of 65 inches/second make it an ideal choice for gamers.